This guest post is written by Amanda Wind, who is currently in Thailand as a volunteer English teacher. I’m 19 years old and embarking on my first international trip to Peru. Offered as an annual study abroad with the Honors Program at my university, I jumped at the chance to travel and learn more from others. For ten weeks leading up to this spring break trip, my class read and discussed material warning of the possible negative impacts of foreign aid or short-term volunteer work. During our 10-day trip, we would be visiting several social enterprises to learn about their projects and how they are impacting the community. 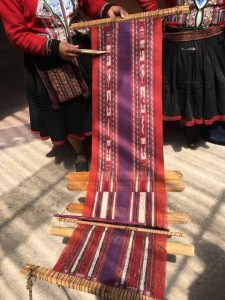 The focus of the trip was learning, not service based, where we visited women’s weaving cooperatives and saw how Quechua peoples are trying to preserve their heritage in the face of globalization. After the trip, we would all present on which project deserves the money we fundraised. LEARNING ABOUT TRADITIONAL WEAVING PATTERNS NEAR CUSCO, PERU. I was bright-eyed and eager to help these initiatives by raising money from friends and family online. Now, I cringe every time I think of the language I used to describe the indigenous communities we visited. Without proper reflection on my actions, I had painted a picture of poor people in villages who needed Americans to donate and save them. At the end of my post, I thanked donors for “saving the lives of Peruvians”. My fundraising goal was exceeded and we were able to donate money to a project run by local community members to build bathrooms at a school. I came back to the US with a passion to travel and help others, but a lack of maturity or self-awareness to understand how my own cultural biases can negatively impact the people who I aimed to “help”. From posing for pictures handing out clothes to school children to the language I used to talk about Peruvians, there are so many things I did on that trip which I would avoid at all costs now. At the wise age of 21, I feel so ashamed to have continued the stereotypes that reinforce the western savior complex. Fast forward a year and I am 20 years old, heading to Cambodia and Vietnam on another study abroad with my university. We had spent the semester before the trip learning about the culture, economics, politics, and history of both countries in preparation for 3 weeks abroad. Again, we discussed how unsustainable volunteer projects can leave communities in disarray. I understood the issues and felt like I had learned more about the pitfalls of my trip to Peru, but most of the concepts wouldn’t be concrete for me until I landed on the ground in Cambodia. Our group spent ten days with Claire and Untac, two dynamic leaders from PEPY Tours (Claire of course also being the co-founder of Learning Service!). During our time in Cambodia, we visited various social enterprises and NGOs, mostly run by Khmers, who were working to meet the needs they saw in their communities. Every evening the group convened for serious and often difficult discussions about what we had learned. Imagine a group of university students arguing about how our American upbringings impact the lenses with which we view issues such as foreign aid, development, and short-term volunteer positions. The conversations didn’t stop at dinner and often ran into the night in our hotel rooms or on long bus rides. While the trip was short, Claire and Untac made it one of the most impactful ten days of my life, ultimately pushing me further along my path of wanting to serve others in the best way possible. I reflected on my own intentions, skills, and goals which resulted in me checking my ego on several occasions. Fast forward another year and I am 21 on my way to Belize for ten days as my final study abroad before graduation. We spend our time co-teaching in classes at a school my university has a partnership with. For 30 years, the education faculty has collaborated with the primary school to work on professional development and teacher training, while offering American teacher candidates the opportunity to learn from another school system. Professors from the education faculty visit the school 2-3 times per year and have hosted several Belizean teachers for graduate programs at our university. As a special education major, I was placed in a classroom that had two students identified with disabilities. I spent the first day observing the classroom teacher and getting to know my students. For the rest of the week, I was able to work individually with them to build reading skills that had been neglected due to a lack of resources for special education. By the end of the week, the students had made a lot of progress, but I was disheartened to see there wouldn’t be any additional support for them after we left. The classroom teacher asked me questions about what she could do to differentiate and help these students grow. Based on input from the administration, my professors led a teacher workshop to help decide how to group students and interpret the data they had collected on the last visit. Although the partnership is consistent and strong, it seemed that we had to adjust our expectations to reflect the slow-moving nature of Belize. On this trip, I felt like I was finally putting the values of learning service to use. With a sustainable partnership model and an attitude of learning first, I was able to use my skills as a special educator to help provide tools and resources to a teacher who felt lost having kids with disabilities in her classroom. I learned a lot about how school systems can differ from the American ones I have experienced. 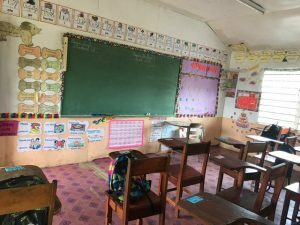 This time in Belize gave me a small glimpse at what it would be like to teach in Thailand with Fulbright. 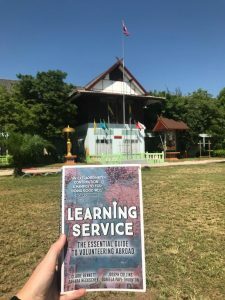 Six months later, I was cracking open Learning Service: The Essential Guide to Volunteering Abroad on a plane to Thailand where I would begin teaching English with the U.S. Student Fulbright Program. It had been a year since I submitted my application and I was eager to get started. I chose Thailand after I fell in love with Southeast Asia on my previous study abroad and wanted to learn/see more. Given I had graduated college a year early, I didn’t feel ready to accept a full-time teaching position (and all the stress that comes with it). I wanted to be thrust out of my comfort zone and grow both personally and professionally. Thinking of the learning service model, I chose a program where I would be a supplementary English teacher, rather than in charge of students’ entire curriculum. The Fulbright program in Thailand has been established for more than a decade with many supports and reflections in place for their volunteers. The office also chooses Thai teachers to spend a year at an American university teaching language to facilitate cross-cultural exchange. For a month in Bangkok, the 15 person cohort learned survival Thai language, teaching methods, and Thai culture. We also got to spend a week with the predecessors from our schools. I was amazed to find a bookshelf full of teaching resources, lesson plans, and props that had been accumulated from the eight previous teachers placed at my school. While this is only my fourth week in Ban Fon, I have already felt so welcomed into my community and school. Teachers in the English department frequently leave fruit at my doorstep for breakfast and are helping me learn more Thai to communicate with others in the community. So far, I’ve learned to relax more and not take myself too seriously. The “sabai sabai” attitude is present in every aspect of life here and I’m embracing it more each day. I am trying to be conscious of respecting cultural norms, such as wearing more conservative clothing, always saying yes to snacks, and showing respect by greeting elders with a wai (prayer hands near the head). I know this year will be a rollercoaster of emotions as I adjust to life in another culture and try to get by with a language barrier. So far, I have been laughing at myself a lot more and accepting situations as they come to me. While there is no perfect way to serve a community or issue, I’ve learned that being reflective and conscious of how my actions affect others will make this year a valuable experience for myself and my Thai students. I know I will learn much more from my year in Thailand than my students will learn from me in our limited time, and knowing that is exactly what learning service is about. Amanda Wind recently graduated from the University of North Florida, majoring in special education. She is now teaching English with the US Student Fulbright Program based in Ban Fon, Thailand. Her hobbies include reading, traveling, being at the beach, hiking, and almost anything where she can enjoy the sunshine! When she eventually returns to the US, Amanda plans to teach students with disabilities and be an advocate for their needs in the public school setting. She is excited about the journey of teaching in a foreign country and is eager to grow both professionally and personally. 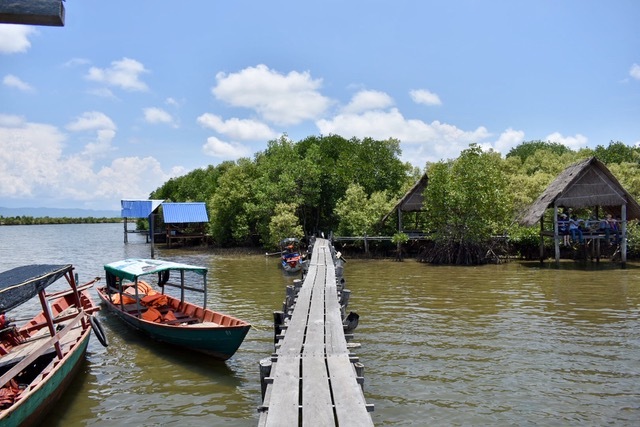 The main photo is from a mangrove project in Kampot, Cambodia.